Today we tell you about a project made together with Susan Rich, artist from Venice Beach, California. We share common passions without borders, like skateboarding and street art, and we have similar stories made of artistic research, handcraft and dedication. So it has been a true joy to collaborate and develop a jewel together, made of recycled wood from a skateboard of mines (from a Zeroskateboard deck) and Susan’s Venice Graffstone, real street art layers “stones” (below you can read more about this amazing material that Susan has saved and developed). We took part at Gioiellodentro award 2018, Metamorfosi. 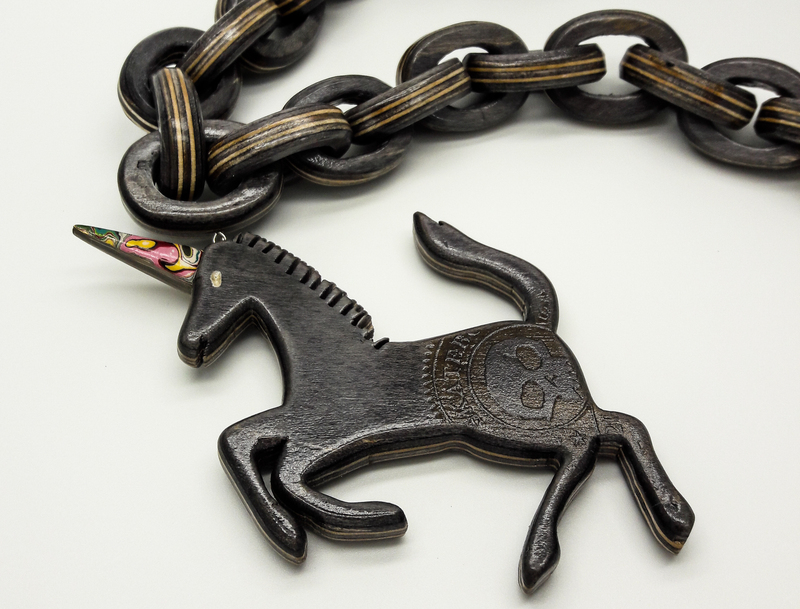 Our project is a huge hip-hop style chain with a horse pendant, both made of recycled skateboard wood… transformed into a magic unicorn by a special graffiti horn, by Venice Graffstone. The concept and the matter are deeply connected in this piece: recycled skateboard wood, a graffiti preciuos stone and the hip-hop style carry the magic of the street in this contemporary amulet. And we are happy to tell that “GRAFF + SK8 = MAGIC” has just been awarded of prize for artistic merit. In 2006 Susan Rich discovered the unintentional manmade agate of graffiti paint that was accumulating on Venice Art Walls, the most famous graffiti walls and one of the first places where this art began. When the Venice Pavilion was demolished in 1999 the City of Los Angeles deemed all that paint to be waste and removed the fallen slab as well as the paint remaining on the other walls.Susan Rich and other Venice locals fought for the art on the walls to be preserved. They won: some walls were left and today these graffiti are a symbol of Venice all around the world. Then the paint on the Venice Art Walls had become so thick and heavy that an entire slab of it weighing several tons buckled under its own weight and peeled off. Rich studied lapidary art and started working the fallen graffiti layers, giving them shapes and treatment to preserve them. Those same works of art exist today as the deepest layers of Venice Graffstone. Susan Rich estimates that each piece of Venice Graffstone has several thousand pieces of art in it. The amount of human energy in artistic intention in every piece is immeasurable. Find out more about Susan Rich and Venice Graffstone on Blogtown.